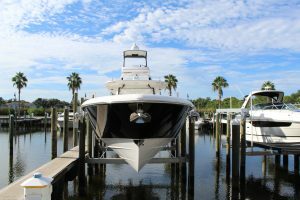 If you store your boat in the water at your property in Gulf Harbor or anywhere else in Hudson, Florida, than you’re probably dealing with constant and expensive upkeep. After all, extended saltwater exposure can cause issues ranging from corrosion to organism growth, so frequent maintenance is a must to prevent damage. However, if you have a boat hoist from DECO Boat Lifts installed on your property, you’ll be able to enjoy all the benefits of waterfront living without many of the hassles and costs. Maxi Lift – A heavy-duty aluminum flat plate drive system allows this boat hoist to lift up to 16,000 lbs. Plus, it is exceptionally cost effective. DECO Lift – Our signature lift system has a sealed gearbox design to reduce maintenance and offers whisper quiet operation. Concept CRS Lift – A direct drive achieves industry-leading lift performance while our patented Cable Retention System (CRS), reduces cable wear by eliminating instances of spooling. Additionally, our boat hoist systems are available in a variety of configurations to suit your specific needs. For example, we offer a boat elevator that can be mounted to the seawall – perfect for narrow canals. Our Beamless Lift is also popular. It features four drive systems and is free of underwater cabling, making it extremely powerful and low maintenance. Learn more about the boat hoist systems that DECO Boat Lifts offers in Hudson, FL, by contacting us today.